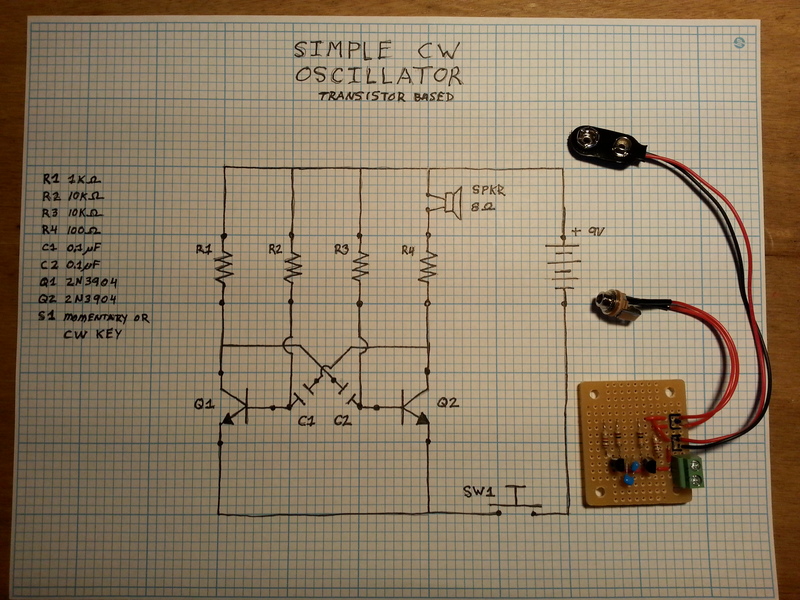 This was the first attempt at an oscillator for practicing CW. 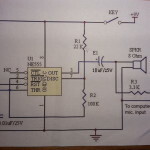 I don’t remember where I found this particular schematic but there are a ton of oscillator circuit designs available online. Click here for a Google search that will result in a lot of options (over a half million hits!) The image results are a good place to start. I committed to protoboarding this design because I wanted to play around with it some more. At the time I built it I was planning on getting an O-Scope but I didn’t have one yet. Now that I have one I can revisit the circuit. 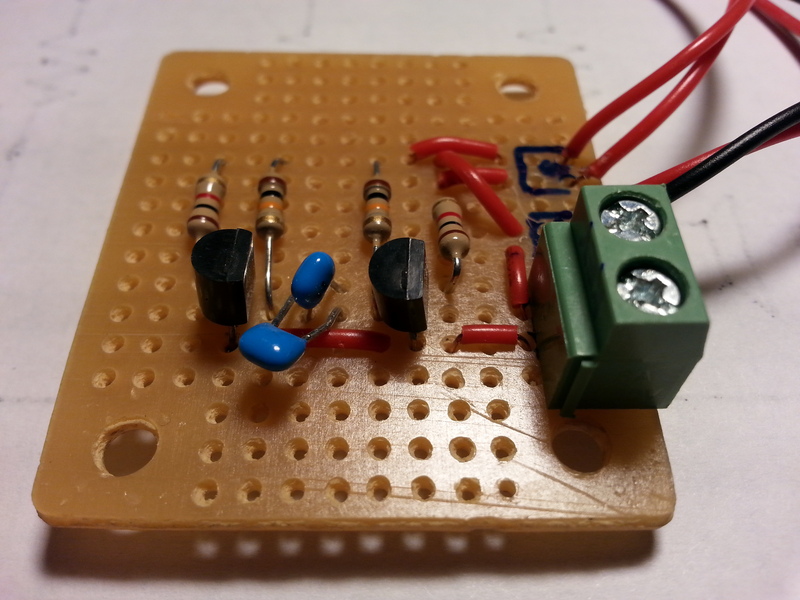 Mark I Oscillator – simple to build and only a few components. Not real stable though. The AF (Audio Frequency) tone is unstable to say the least. It varies from 3kHz to about 200Hz . The wave form resembles a square wave, but only loosely. It is very spiky and irregular. 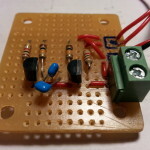 While this is a simple circuit to build, uses only a few components, can be built very inexpensively, was a fun basic electronics project, and would be good as a beginners circuit / soldering project, I wouldn’t plan on using it for much more. I would avoid it for a CW practice oscillator. If you are serious about learning CW, do it with a stable oscillator that will be pleasant to listen to. This thing can squeal at times. As the section title above says, this oscillator is based on the 555 timer integrated circuit, a much more stable oscillator, also with few parts. I documented the build on Flickr but the focus was more on the cabinet build and less on the electronics. 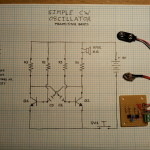 This circuit makes a good CW practice oscillator. Still a very easy build for beginners and fun. I was going for a steampunk look with the cabinet build. There are many things I think I would do differently in the cabinet build to make it easier, and smaller, but the oscillator works just fine as is. The waveform is a pritty clean and produces a consistent 724.8 – 725.2 Hz tone. This circuit does consume more energy then the other. I put a fresh battery in the oscillator, had done a week of cw practice 20 minutes a day when life called and shelved it in May 2014. I just took it down and did some testing when the battery died. Thing two I might change, a positive power cut off switch to completely lift the battery from the circuit. Just a thought. 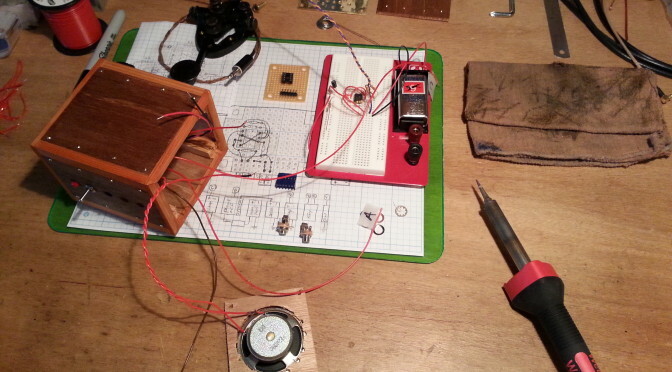 Here is a short video of the cabinet and the oscillator in action with a CW key. There is no additional AF amplifier which brings up the one thing I might change. 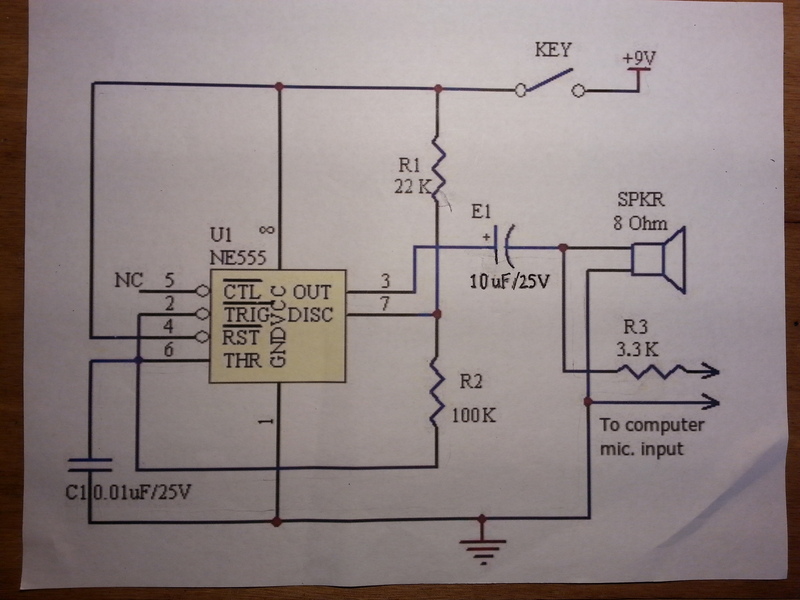 It my be a good idea to add a variable resistor on the output to adjust the volume.